The article talks about spraying. Can I just water the soil around the roots, or do I have to spray my tomatoes and seedlings with the mixture? Thanks, Marcia. Spraying the stems and leaves directly with the mixture will be most effective. 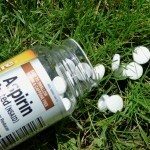 The aspirin works by stimulating the plant's immune system and doesn't kill pathogens/pests directly, and I'm not sure whether the plant can absorb it from the soil, so the best bet is spraying directly on the plant.